Nice elevator when it’s working. The opening of the Gibbs Street Pedestrian Bridge in July 2012 came amid much fanfare. The $13.6 million span over Interstate 5 provided a much-needed connection between the Lair Hill neighborhood and the burgeoning South Waterfront. While it’s a beautiful bridge to walk and bike on, it has one major flaw. 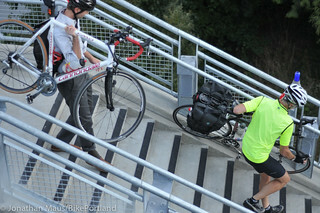 There’s no ramp to make bicycling easy and smooth at the transition to the South Waterfront side. 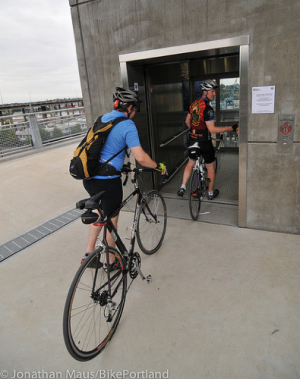 Once you get to the east side of the bridge, the design requires people to: carry and/or push their bikes on six flights of stairs with only a narrow and hard-to-reach wheel gutter to ease the task; or use an elevator. befitting of a bike-friend city. “Sort of a joke,” and “atrocious” is how we’ve described the design of the bicycle wheel gutters on the stairs of the new Gibbs Street Bridge. Now it appears that the Portland Bureau of Transportation (PBOT) will do something about it. A sign of disrespect? Or a minor inconvenience? 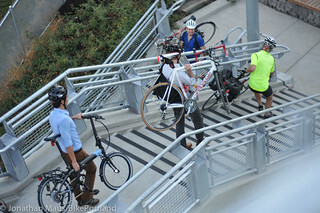 On the eastern end of the new (and carfree) Gibbs Street Bridge over I-5, there are two options: You can either carry/push your bike up or down the many flights of stairs, or you can wait for the elevator. When the elevator is not working — which has been the case four times since the bridge opened in July — you are left with only one option. And, as I noted earlier this month, the stairs can be challenging if you have a bike. Looking east from SW Gibbs. 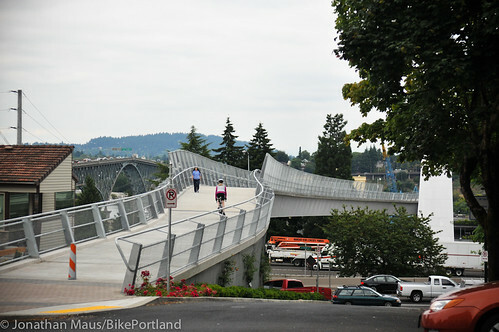 The Gibbs Street Pedestrian Bridge — a bridge built solely for people to be able to safely walk and bike across I-5 between the Lair Hill Neighborhood and the South Waterfront district — is now set to open on July 14th. When I last reported on this project, the opening date was late May. To celebrate the completion of the $12 million project (PBOT paid $2 million for it, the feds paid the rest), the City is hosting a ribbon-cutting party from 10:00 am to 2:00 pm. While project consultants Alta Planning + Design say they expect traffic on the bridge to be evenly split between people on bikes and on foot, it remains to be seen what it will be like to ride on the new bridge. The steep stairwells leading from the eastern end of the bridge down to SW Moody Ave (connecting to the south end of the new cycle track) have wheel gutters off to one side. In addition, PBOT project manager Jean Senechal Biggs says bikes will be allowed in the elevators. In fact, she says, “The elevator was designed to fit a bike with a trailer attached,” (which means bakfiets and other cargo bikes should be fine too). It’s been just about 16 months since the Gibbs Street Pedestrian Bridge broke ground. And lo and behold, it’s set to open late next month. 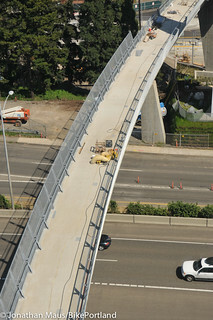 I took a ride in the Aerial Tram yesterday and snapped a few photos of the new bridge (scroll down). I didn’t realize this project was so close to completion. Once open, the bridge will connect the Lair Hill neighborhood to the South Waterfront District. 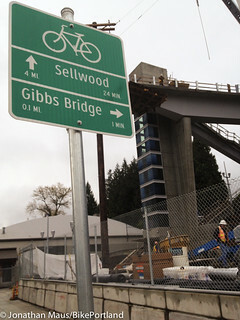 The west end of the bridge is at the intersection of SW Gibbs St. and Kelly Ave. From there, the bridge winds over I-5 to an elevator and staircase that stand at the southern end of the new cycle track on SW Moody. The stairs are expected to be bicycle-friendly but I have seen them up close yet. I imagine most folks would just take their bikes on the elevator. Construction of the Gibbs Street Pedestrian Bridge is set to being this month and Portland Mayor Sam Adams will host a ground-breaking event this Tuesday. 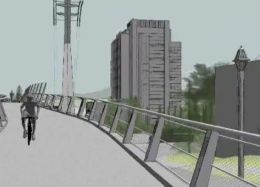 The City of Portland is moving forward with their plans to build a new bike and pedestrian bridge over I-5 that will connect the Lair Hill neighborhood with the South Waterfront district near the Aerial Tram. One of the concepts drawn up for the new Gibbs Street bike/ped bridge.